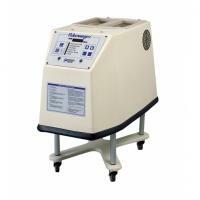 Fluidotherapy Model 115 Our Fluidotherapy line comes in three different models that have specially designed fluidized beds, that combine the precise control of dry heat temperature and airflow with CELLEX media. This combiantion works to generate the mechanical effects of skin desensitization and limb buoyancy For treating up to two hands or two feet independently or at the same time. Unit is removable from stand for easier completion of lower extremity applications. Features: Double extremity unit. Standard capacity; holds 40 lbs (18.1kgs) of CELLEX media. Microprocessor-based controller. Electronic temperature controls. · Regulated/Adjustable air speeds. · Pulsed or continuous operation modes. · Electronic treatment timer. · Wake-up pre-heat timer.